This explanation follows on from the previous article How an eye on equine entheses can beat navicular. This is a totally new level of research, and trying to explain the phenomenon limiting the focus to the hoof capsule is in plain contradiction with the findings of this new level of study exposes. A basic understanding of physics allows comprehending that the junction of an elastic structure such as a tendon, with a rigid structure, such as a bone, is submitted to specific forces. Both sides of the connection, the rigid one and the elastic one, have to deal with unusual forces and nature has created specific material on both sides of the connection, the bone and the tendon. The study of this material, which includes evidently the study of the acting forces underlines the concept that the science of motion has constantly emphasized. There is no doubt that proper functioning of the hoof capsule is necessary but it is only one part of the problem. The other problem is limbs kinematics and forces loading the limbs. One problem is how impact forces are absorbed by the hoof structure. This is the task of the farrier or hoof trimmer. The other problem is the intensity, duration and direction of the forces coming from the horse’s body mass and movements down through the limb and acting on the joints and hoof structure. This is the rider and trainer responsibility. The problem is that riders and trainers are prompt in relinquishing their responsibility on the farrier, the saddle fitter, the vet, or the therapist. The other problem is that each specialist is prompt in thinking that he or she can resolve every problem. Instead of a network of specialists adding their respective knowledge for the good of the horses, the equine industry has become a series of individuals trying to pull the blanket back on their side. The damages on the deep digital flexor tendon, that is visible on the top picture just under the back and red arrow, result from a kinematics abnormality that we have observed many times with horses suffering from navicular syndrome. Under normal circumstances, as the hoof impacts, the fetlock translates downward. Simultaneously, the canon bone rotates forward around the fetlock. Many diagrams of front limbs kinematics have been published and the one by James Rooney is clear and easy to understand. We color in red the canon bone, the fetlock and the pastern The below illustration needs to be read in order. 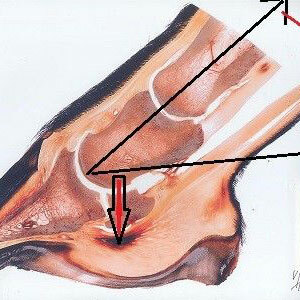 At impact, the canon bone, fetlock and pastern are aligned as shown on 1. As soon as ground contact, the fetlock translates downward while the canon rotates forward around the fetlock. This is shown on 2. Under normal circumstances this is about the moment where the process inverses as the fetlock starts translating upward, 3. The upward translation of the fetlock continue as the canon bone comes back toward a more vertical alignment, 4. The kinematcis abnormality causing excessive stress on the deep digital flexor tendon and the distal sesamoid bone occurs between the second and the third diagram. The fetlock translates lower or longer and the canon bone passes ahead of the vertical before the fetlock starts its upward translation. Position of the canon bone and pastern are illustrated here with the green lines. At this precise instant, a high compression is created between the distal sesamoid bone pushed down by the bony column and the deep digital flexor tendon that is pulled up by the forward rotation of the canon bone and therefore the whole front limb, around the fetlock. This is the kinematics abnormality that we have observed over and over on horses affected with navicular syndrome. What the new level of research and progresses in imaging reveals is that the kinematics abnormality induces strain and damage on the deep digital flexor tendon before the navicular bone is affected. Now that you have in mind a sound picture of the mechanism, we can come back on the original illustration and understand the process. As the front hoof alights, the first and second phalange of the pastern are aligned as illustrated on this picture,(black arrow following the line of both phalanges.) As soon as the horse body weight loads the front limb, the fetlock translates downward as illustrated by the red arrow. Under normal circumstances, the fetlock reverses the downward translation into an upward translation when the canon bone is on or just passes the vertical. This is illustrated by the black arrows. When excessive weight is loading the front leg, the fetlock continues for a very brief instant its downward translation while the cannon bone passes the vertical. This is illustrated with the red lines. This is the kinematics abnormality that induces excessive weight on the distal sesamoid bone and below the navicular, the deep digital flexor tendon. On this picture the damage is apparent on the deep digital flexor tendon but not yet on the navicular. If the kinematics abnormality is not corrected in a matter of weeks or months, the navicular bone will be affected. The study of course explains how the long toe, low heel situation aggravates the intensity of the stress on the distal sesamoid bone and the tendon. Dr. Betsy Uhl DVM, PhD, Dip, ACVP, will explain the whole process in great details during our Science of Motion, 2015 International Conference. Whether hoof care extremists like it or not, proper balancing and functioning of the hoof system is necessary but it is not sufficient to prevent the kinematics abnormality exposed here. The riding and the training techniques have to distinguish the kinematics aberration and above all, identify and correct the source of the kinematics abnormality causing abnormal stress. The main reason for the kinematics abnormality is excessive weight on the forelegs. Modern imaging places in color in front of our eyes the damages created by riding and training techniques such as long and low, driving seat, heavy contact on the bit, deep work, which are increasing the load on the front limbs. The second main reason for such damage is the preferential rotation. Lateral bending of the horse thoracic spine is always coupled with a movement of transversal rotation. While theoretically the transversal or axial rotation should be even right or left, reality is that natural back muscles imbalance always causes preferential rotation one side or the other. There are many cases where the transversal rotation is inverted as the dorsal spines turns in the wrong direction. It is quite easy to understand that if the rotation is preferential on one side, the force produced by the hind legs and travelling forward through the spine are redirected on one front limb causing excessive load. This of course is aggravated if the horse is already working deep, or long and low. Knowledge is the horse’s sole protection. Only the rider’s knowledge can distinguish pretenders for true professionals. Allowing anyone advertising rehabilitation and other promises, social media, has been unfair for the horses. Modern imaging is now rebalancing the horses’ chances of soundness. Any poor riding and training technique can be well presented as long as no-one can see the damage. The horse might complain but his attempt is rapidly dismissed as behavior. With persuasion pretenders can convince novice riders that they profess the true or the classic but; now that you have seen the pictures you might have a second thought before driving your horse on the forehand. You might even decide on standing up for your horse. Then; the science of motion welcomes you in the wonderful world of knowledge. I enjoyed your article. I was wondering understanding the movement of the leg requires the knee to break in motion before the hoof itself can come off the ground.The relationship of the length of toe and heal of the hoof can effect the load and breaker of the hoof while in motion. This can cause the horse to bear greater amounts of weight longer and also affects the position of P1,P2 and when and where the ground forces are absobed. I would enjoy more conversation on this subject I worked with CJF Randy Lukahrt. Thank you for this article. It was written in an easy to understand way. Having trouble with an older horse since over a year being lame in the left front and helpless vets with no ideas except spending more 1000s of $ I don’t have, it give me ideas on how to approach this now.